You don’t need to call this actual pizza, because the lack of cheese means you’re left with tomato sauce on bread. Call this flatbread, if you prefer to maintain the integrity of the term “pizza.” Or use the below pizza crust and sauce recipe, and add your choice of cheese if you tolerated dairy. This sturdy crust will hold up to whatever toppings you choose. You’ll have this simple recipe memorized after making it a few times, and you’ll be reaching for it often. Coconut flour and arrowroot flour — These two flours work a balancing act. The coconut flour provides a fluffier, lighter texture but can be too dry when used as the only flour. It can also be digestively challenging when used in large amounts due to the quantity of fiber, which is why I like to pair it with arrowroot flour. Arrowroot flour creates a chewy texture and sweet flavor. You can always substitute tapioca flour for the arrowroot flour, as they have the same baking properties. 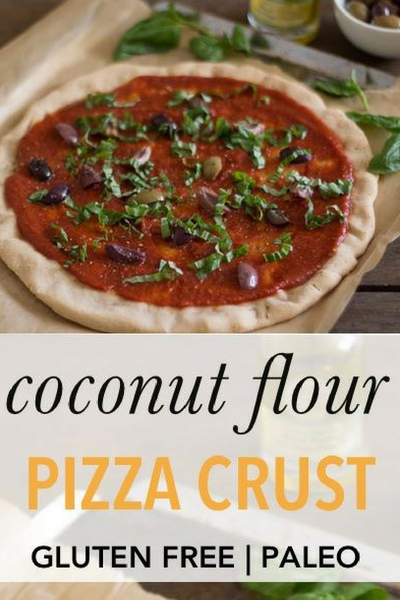 Olive Oil — Olive oil lends a traditional flavor, but I certainly have been known to make this crust with melted coconut oil, because coconut oil. 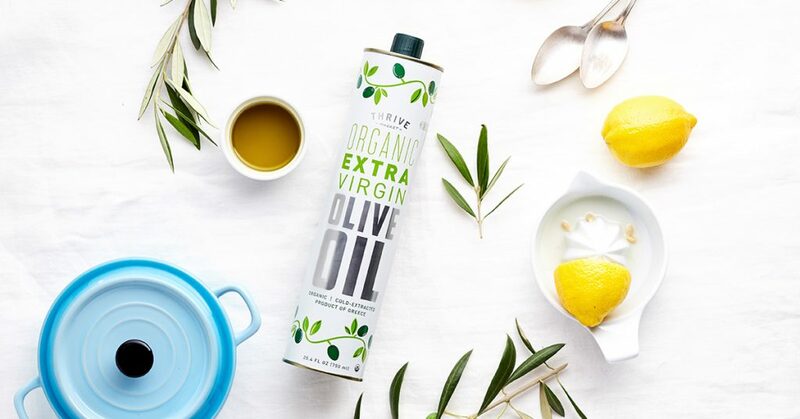 If you choose olive oil, I would point you to this gift-with-purchase organic olive oil at Thrive. It’s an organic, peppery Greek olive oil that’s a $31 value. Egg — If you are egg-free, you’re probably bracing yourself for my line, “this recipe requires real eggs to maintain integrity.” For a different texture, you can enjoy the recipe without eggs. As a matter of fact, recipe is inspired by the Egg-Free Italian Flatbread Alaena shared when she guest posted here. I added an egg and leavening (baking soda and vinegar) to her recipe, and so my version is more bread-like. If you can have eggs, I’d recommend you try both recipes to find your personal preference. Truffle oil as a topping — If you, like me, cannot tolerate cheese, try drizzling your cheese-free pizza with truffle oil. It adds unctuous, umami flavor (say that five times fast). I combine it with fresh basil, tomato sauce, and olives for gorgeous result. This Simple Paleo Pizza Crust will be a staple in your home, and you'll have the recipe memorized after making it a few times. Coconut and arrowroot flour create a chewy, golden crust that holds up to generous toppings. Combine the dry ingredients, then add all the wet ingredients and stir to create a soft dough. 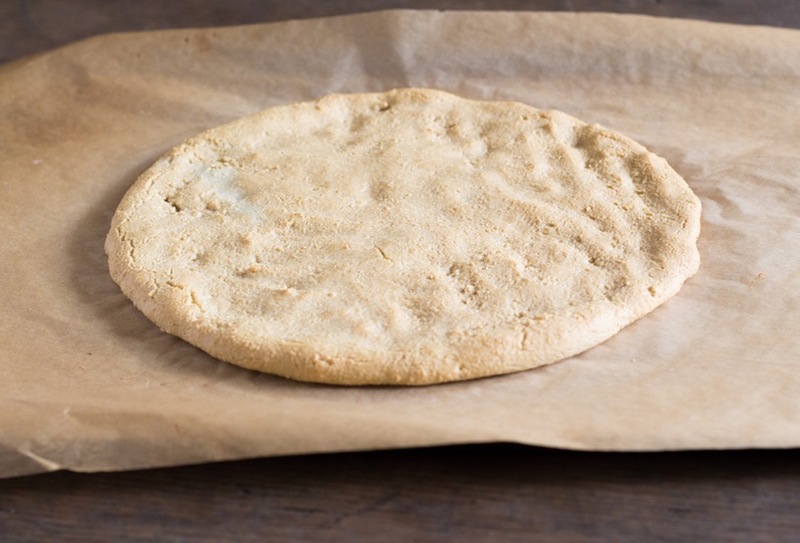 Press the dough into a circle, a generous ¼ inch thick, on the prepared baking sheet. Bake for 10-12 minutes until golden. Add your toppings, then broil if desired to melt/crisp the toppings. What I use for toppings: I simmer a jar of crushed tomatoes until it is thickened, about 15 minutes. Then I add salt, pepper, and whatever herbs I desire to create a speedy pizza sauce. 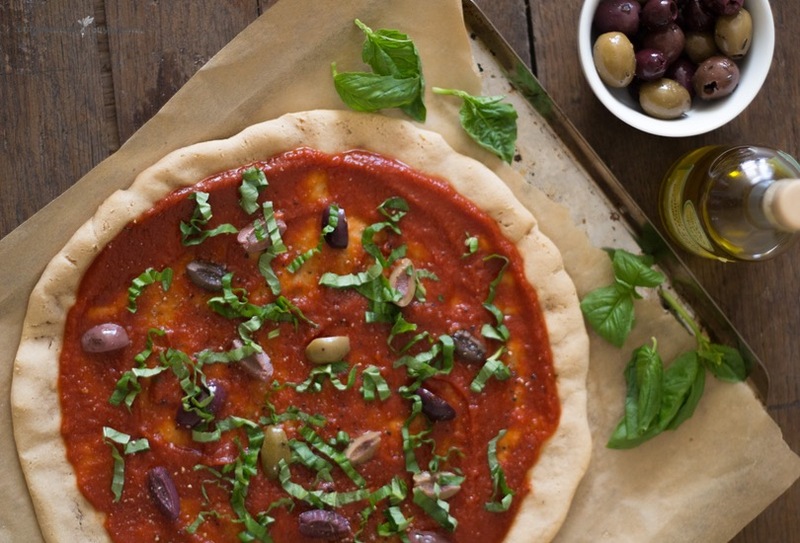 I top the pizza with the sauce, sliced olives, and fresh basil for a dairy-free pizza. I also drizzle just a dash of truffle oil over the top. If you tolerate dairy, crumbled goat cheese is delicious! Note about truffle oil: I was informed by a reader that most brands of truffle oil contain the iffy "natural flavors" so please be aware of that. You can use pure truffle oil, made with real truffles and olive oil, or substitute any other infused olive oil. This crust is amazing! This will be my go to from now on. I’ve been on the candida diet a month now and recipes like this make me so excited! Thank you for sharing! I’m glad you and your family enjoy this recipe! I think it will work if you just double all the ingredients. I don’t foresee any challenges. This looks delish! Is there any chance that you have any low histamine and nightshade-free suggestions for the pizza toppings? i.e. no tomatoes and olives? Thank you!